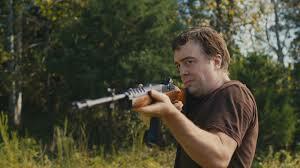 Dwight (Macon Blair) is the opposite of yer average action hero. 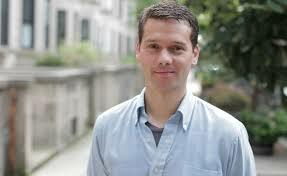 He has a nerdy haircut and it is a cinch he hasn’t been to a gym or hired a personal trainer. I didn’t know why Dwight stabbed Wade Cleland in the head in a barroom toilet in the early part of the film and I wasn’t sure why his sister Sam (Amy Hargreaves) was so angry at him. “I’d forgive you if you were crazy. But you’re not. You’re weak.”, she snaps, backing out of the driveway of her home in a loaded station wagon and heading for parts unknown. Imagine meeting a guy like Dwight in a bar. He may seem a little strange but harmless at first but gradually his motives for doing what he plans to do become clear. 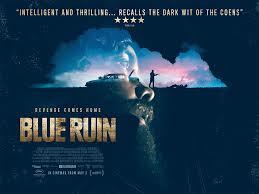 Director Jeremy Saulnier (who also wrote the highly original screenplay and served as his own cinematographer) gets a lot of value (and generates a lot of suspense) for what is obviously a very low budget. The camerawork – and the fact the cast is made up of unfamiliar faces (the exception being former Brady Bunch regular Eve Plumb) gives this revenge thriller an almost documentary-like feel. 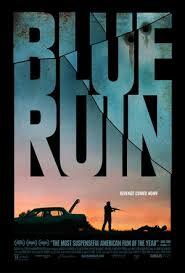 Obviously, Mr. Saulnier is an artist to watch (A sequel to Blue Ruin is rumored to be on the way). 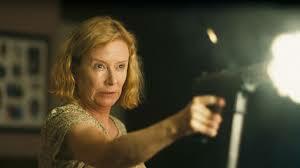 It is only a matter of time before this multi-talented young filmmaker is scooped by Hollywood studios. Hopefully, he will not lose his economy of narrative when he is presented with a bigger budget.